Traffic Signal Timing Optimization | Resource Systems Group, Inc. Following a major New Hampshire Department of Transportation (NHDOT) roadway expansion and intersection improvement project on the busy NH 12A corridor in Lebanon, New Hampshire, RSG was asked to refine signal timings during peak periods to ensure traffic flows through this corridor operate as effectively as possible. For many years the NH 12A corridor has operated with long delays, long queues, and oversaturated conditions, while remaining the retail and economic hub of the Upper Valley region of New Hampshire and Vermont. To improve conditions on this important corridor, NHDOT undertook a major construction project that included widening the I-89 Exit 20 overpass, adding new turning lanes at several key intersections along the NH 12A corridor, and constructing a new tunnel connection underneath I-89 between two major shopping plazas. However, following completion of this impressive infrastructure project, vehicle progressions between intersections within the coordinated signal system were not operating at full efficiency due to changes in traffic flows and distributions since initial design inception many years prior. 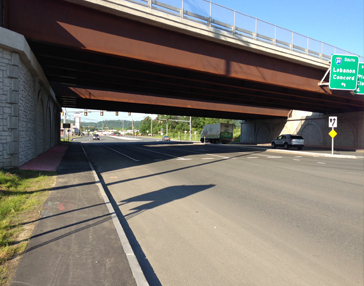 To ensure the updated corridor operates at maximum efficiency, NHDOT retained RSG to observe traffic flows and develop an optimized set of intersection signal timing offsets. RSG examined conditions during the weekday morning, midday, and afternoon peak periods, and during the weekend peak, and developed four sets of optimal signal offsets tailored to the coordinated timing plans used during each period. These timing plans allow for platoons of traffic to traverse the corridor most efficiently and with minimal overall vehicle delays, for the unique traffic flow patterns occurring during each period. After installing these updating signal timings in the field, we have observed significant improvements in vehicle progressions and reductions in overall delay. Wow – They Actually Fixed 12A!